I am the mother to 2 amazing boys: Declan who is 10 and Brendan Bjorn who is 14. Brendan was born with congenital CMV which has left him severely disabled and medically fragile. He is my angel. And one day, he will no longer be an angel on this earth, but one that looks over me and his little brother from a place far more beautiful than I can imagine. This blog is about our journey together. This blog is about his journey; about being an angel in transition. Who cares for the carer when they need care? That is a complicated question. Or rather, the answer is what’s complicated. It’s the ones who really love you that stay around after they have been vomited on in that way. And we carers thank each and every one of you very special people in our lives. But don’t worry, we will probably be right there cleaning it up once we’ve done it. That’s just what we do. It’s ingrained in us. Back to the question of who cares for the carer when they need care. The answer is: I’m not really sure. 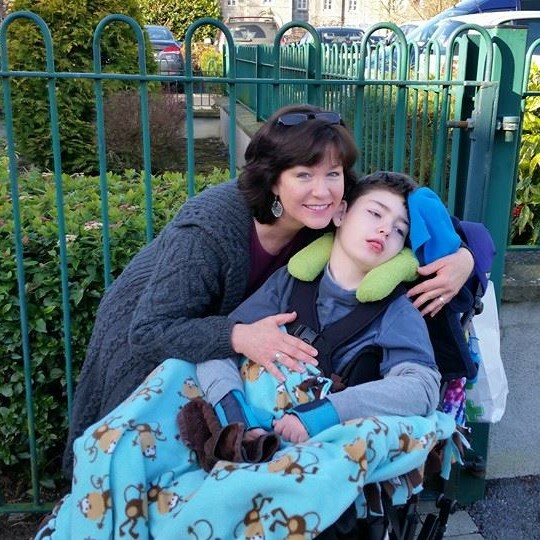 We as carers of children with a life-limiting illness are often told “make sure you take care of yourself, too.” And while that is, of course, excellent advice, it doesn’t often work that way. You see, we are usually too busy taking care of others while we run on fumes. Recharging our own batteries would take time, and energy, away from the caring. And if we did take that time, we often return to twice as much work. Kind of like when you take time off from your paid employment. You come back to a desk with twice as much work. So, truth be told, we really don’t get the chance to take care of ourselves. Yes, an absolute big fat YES, we need to take care of ourselves. But sometimes, just sometimes (I lied there, we need this more than sometimes), we need someone to care for us…nurture us, cradle us in arms of comfort, tell us that everything is handled and we don’t need to do a thing (and then most importantly, actually have that be the reality). That is what we need – and deserve. Thing is, even if we don’t get it, we will probably continue on as we were, lying to most about how well we are doing. Except, of course, for those lucky few who get emotionally vomited on. Sorry about that, dear friends. Be rest assured we will clean it up.